One of the most hypocritical conundrums in college sports is who is eligible for postseason bowls and playoffs in NCAA Division I sports and who is not. Five teams will play the regular season knowing they are banned from the postseason for poor academics. All five happen to be historically black colleges and universities (HBCUs): Howard, Morgan State, Florida A&M, Savannah State and Southern. Across all sports, the NCAA banned 23 men’s and women’s teams from postseason play this year for falling below its requited 930 Academic Progress Rate (APR) score. The score, based on data the colleges supplied over the last four years, is supposed to predict a 50 percent graduation rate based on athletes remaining in school and being academically eligible. The goal of 50 percent was long proposed by the Knight Commission on Intercollegiate Athletics. 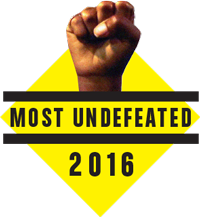 Of those 23 teams, 22 belonged to HBCUs. The only exception was the men’s track team of Virginia Military Institute. At Morgan State, athletic director Floyd Kerr told The Baltimore Sun last spring that the football ban (along with men’s cross-country) was “a message to the university that we need to do a better job.” Kerr said the university was redirecting resources to student-athletes. It is hoped that those HBCUs will do the right things and get in compliance. But it seems like HBCUs are forever spinning on a roulette of teams making the grade or flunking. While a school like Hampton University rebounds from a postseason football ban in 2012 to being called a “perfect role model” for other MEAC schools by a local newspaper, Southern gets its postseason eligibility back in basketball this year only to lose eligibility in many other sports. The NCAA is helping, or is it? In short, it should reflexively raise a red flag that HBCUs — which play football in the secondary tier of Division I called the Football Championship Subdivision (as compared with the Big 5 power schools and conferences that play in the Football Bowl Subdivision) — provide a convenient whipping post for the NCAA. Ever since their founding in the seemingly interminable decades of segregation, HBCUs have been underfunded by state governments and, because of America’s history of blunting and blocking black people from wealth accumulation, unable to draw from a broad swath of wealthy alumni and boosters, compared with donors to private, white-dominated institutions and flagship public universities. 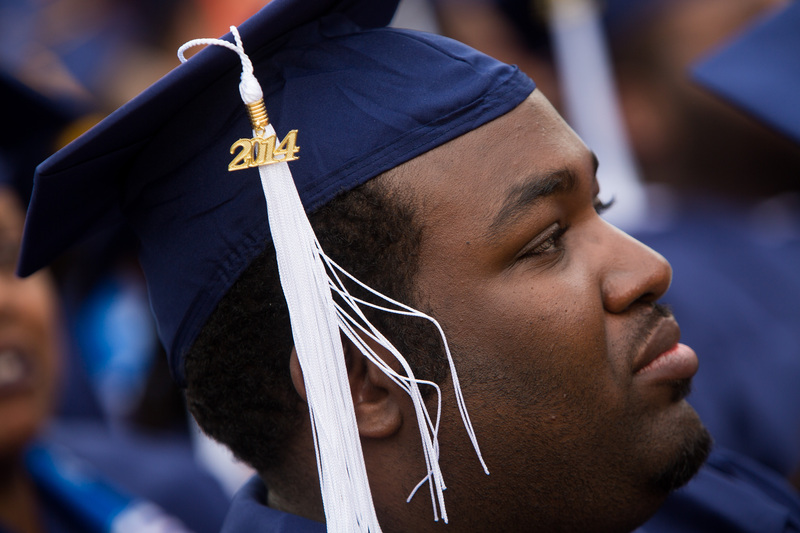 Graduates participate in Howard University’s 146th commencement exercises on May 10, 2014, in Washington, D.C. The NCAA is somewhat sympathetic to this. It has recognized those historical deficits to some degree by creating the Accelerating Academic Success Program, which gives “resource-limited” schools more time to get their APR up to 930 and provides financial support to help bolster academic support in athletic departments. Schools can receive up to $900,000 over a three-year period. But the fact the NCAA is happy to single out black progress when the news is good actually betrays the blind eye the NCAA maintains when the news is bad for black athletes at predominantly white schools. I’ve tracked graduation rates for 20 years of football and basketball programs at bowl and tournament time, publishing those results in The Boston Globe. When I started, there’d be years where several teams in basketball’s March Madness had a zero graduation rate for black players and most bowl games involved at least one team where the black graduation rate was below 50 percent. While there has been massive overall improvement over the years, I maintain that the NCAA maintains a blind eye to the most persistent level of academic abuse of black players. These are the schools where predicted overall APRs and long-term Graduation Success Rates (GSR) of at least 50 percent hide hideous disparities between white player rates way above 50 percent and black player rates below the mark. If the NCAA is going to shame HBCUs with one of its most severe penalties, it ought to also ban postseason play for schools with chronic disparities that are injurious not only to the athletes themselves, but contribute to stereotypes that black players are dumb jocks with only one purpose: to run the ball for presidents, boosters and conference revenue. Take last year’s FCS championship bracket. North Dakota State has won the last five championships, with a current GSR of 62 percent. That rate is calculated from the actual graduations over the last four freshmen classes where each athlete had six years to graduate. But an examination of North Dakota State’s GSR shows a white graduation rate of 78 percent, more than double the 36 percent for black players. Northern Iowa: 47 black/94 white. Florida A&M offensive lineman Keenen Anderson (No. 75), linebacker Emilio Gibbs (C), and defensive tackle Javon Hunt (No. 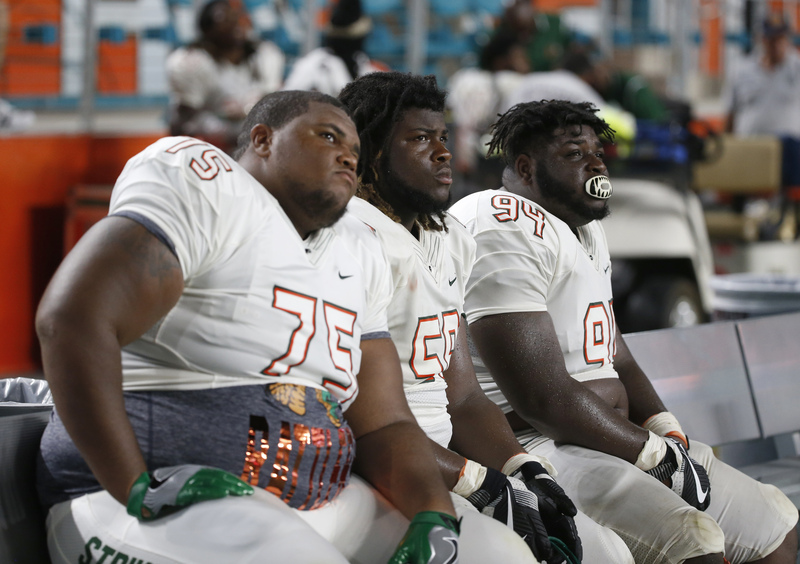 94) watch from the bench during the final minutes of an NCAA college football game against Miami on Sept. 3 in Miami Gardens, Florida. A call and email by The Undefeated to the NCAA to revisit Emmert’s position were not returned. But five years later it is clear that the NCAA refuses to address this issue, both in the FCS and the monster schools of the FBS. Iowa, Michigan State, North Carolina, Texas, California and Southern California are athletic powerhouses where the black GSR ranges from between 43 and 48 percent for black football players and the white rate ranges from 73 to 94 percent. It is even worse in men’s basketball, where these schools have a 100 percent GSR for white players, but less than 50 percent and as low as 14 percent for black players: Illinois, Michigan State, Oklahoma State, Texas Christian, Washington State, LSU, Mississippi State, Texas A&M, Central Florida, Texas-San Antonio, Ohio, Fresno State, Hawaii and Wyoming. Other national powers under 50 percent for black players include UCLA, Cal, Connecticut and Cincinnati. When you add it up, it is almost as if HBCUs are being punished for having all-black or mostly black programs, taking on players not coveted by major powers, with far fewer resources to help those from difficult backgrounds to adjust to the dual demands of college and sports. The median spending per football player in the FCS is $42,000. Among the HBCUs banned for the football postseason, only Morgan State comes close at $38,000. The rest of them range from $21,500 to $33,500. The top powers in the FCS spend between $48,000 to $98,000 per football player. All of that, of course, is dwarfed by teams competing in the FBS, where Texas and Cal spend a respective $383,000 and $321,000 per football player, and still don’t graduate half their black players. The HBCUs may deserve their postseason bans. But if the NCAA stops there, that is no different from our last three decades of punishing black drug offenders who are easy to sweep off urban streets, while white offenders party behind picket fences and even if caught, are protected from hard time by privileged access to legal resources. The only way the NCAA can show it is not imprisoned by that mentality is to crack the same whip on Texas and North Dakota State as it does on Southern and Howard. Any school that has APRs and GSRs below 50 percent for black players should be banned from the postseason. It is easy to punish black schools with no relative resources. Real courage means taking on the modern academic segregation that exists on too many teams in Division I.
Derrick Z. Jackson is a Pulitzer finalist, 10-time winner from the National Association of Black Journalists and a 2018 winner from the National Society of Newspaper Columnists for his work for The Undefeated. He co-authored Project Puffin: The Improbable Quest to Bring a Beloved Seabird Back to Egg Rock.